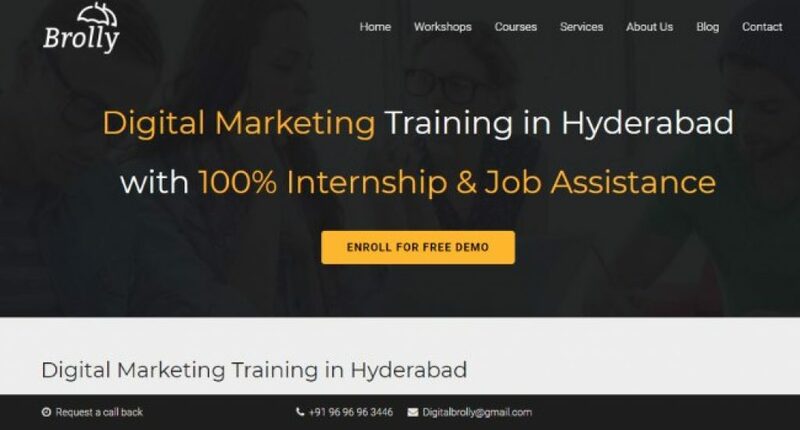 Digital brolly is the top Digital Marketing Training Institute in Hyderabad, whatever your field of educational/professional background is, we assure you that we provide the right knowledge on Digital Marketing concepts and strategies with our trainer’s individual supervision. We facilitate an opportunity to turn your ideas into reality with our training and guidance. We also offer customized training and report analysis for organizations to improve their businesses. Digital Marketing is the most stable job field in India today. With the Indian government promoting Digital India Activities it is expected to grow even further and get even better. We aren’t the mob-driven institute with 100’s of individuals sitting in each other lap struggling to figure out what the trainer is trying to teach. In fact, we are strictly against it as our batches will not have more than 20 individuals per batch. Our institute is provided with proper infrastructural intellectual facilities that aid the individuals in concentrating on the class and grasping the concepts better. Our small and specifically designed batches give our trainers the best possibility in focusing on each trainee and make an impact on their learning. What problems does Digital Brolly solve? We bridge the gap between the real-time work and the theoretical knowledge. With more than 1,50,000 jobs being created in digital marketing every year. We aim to provide quality resources to the industry while helping the individuals to create a better life for themselves. Services for any company looking to promote their products or services Online. Training for Students, job Seekers, Corporate, Entrepreneurs. Enrolled 100+ students in just about 3 Months. Working as a Digital Marketing Partner Agency to 10+ companies across the globe. Expand our services to more clients and setup multiple branches for our training institute/ Offer franchises. I visit this place regularly, they do a pretty good job.